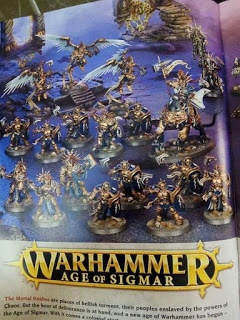 Looks like space marines to me and on round bases to boot, why this isnt called the Age of Space Marines is beyond me. I personally wont be moving to the Age of Space Marines and will be sticking with 8th edition and my wonderfully non space marine armies for that edition. I encourage all fans of the past 8 editions of WHFB to do the same, 8th is a great edition and right now i see no reason to change. Until next time. But have you seen the Chaos minis yet? Absolutely freaking amazing. Can't wait to see what they come up with for the other races - the miniatures themselves, in terms of design and sculpt, are nothing short of fantastic. The Chaos miniatures do look good and who knows, maybe the other races will be even better. Technically very nice minis but as you struck on it doesn't hit that familiar note. I personally like them but I've never been a big fan of the Empire's look. Also Age of Sigmarines has been the leading mock name thus far. Yep. Same here. I want to know how it plays and what form Undead will take in this new game. My Empire, my beautiful Empire! What have they done to you! If I wanted to play a Sanguinary Guard army I would have GW. Looks more and more like i'll just be selling my WHFB stuff once the new edition drops. I'm with you there Rex. These Space Marines don't do it for me. At least Chaos remains Chaos, even if they also look like CSMs now. I suspect we are moving to a overlap game somewhere in the future, where you can use just about anything in the Age of Sigmarines. Like that term. I'll be waiting till I read the rules and play a few games. There's nothing stopping us using minis we like to represent the models. All that matters is are the rules good. There are plenty of alternate mini companies out there to source armies we like the aesthetic of. If not then Trade Me and Ebay will supply you. sorry for the rant I just can't look past the six packs seriously why would you sculpt armour like that?